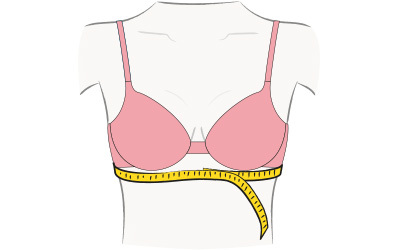 Calculate your basic bra size with a tape measure while wearing a normal bra (one without padding or push-up features). This will give you an approximate size only – visit your local Farmers if possible for a more accurate fitting. 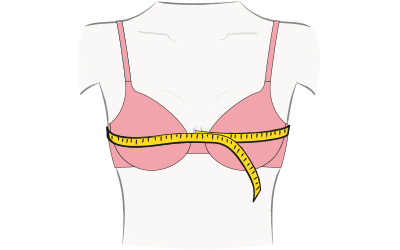 Measure your chest directly under your bust. Ensure the tape is level all around and exhale completely. Measure your chest around the fullest part of your bust. Again, ensure the tape is level all around. Sorry, we can't identify a standard bra size for you. Try remeasuring, then try decreasing your band size and increasing your cup size by a centimetre or two to allow for the typical margin of error. Otherwise, ask a friend to help or head in for a professional bra fitting at your local Farmers. Your measurements are only a guide – but an essential starting point. Bra sizes vary between brands and bra types – visit our instore fitting consultants to help you get the right size and style for your shape.